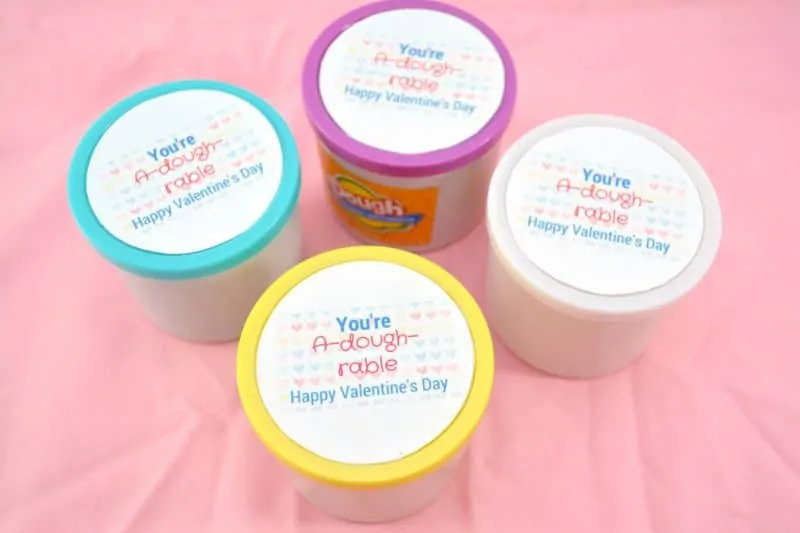 With this “You're A-dough-rable” Play Doh Valentine printable you can turn a plain jar of playdough into a Valentine's Day gift that is perfect for kids to give their classmates or their teachers. Ah, what would Valentine’s Day be without all the cheesiness? 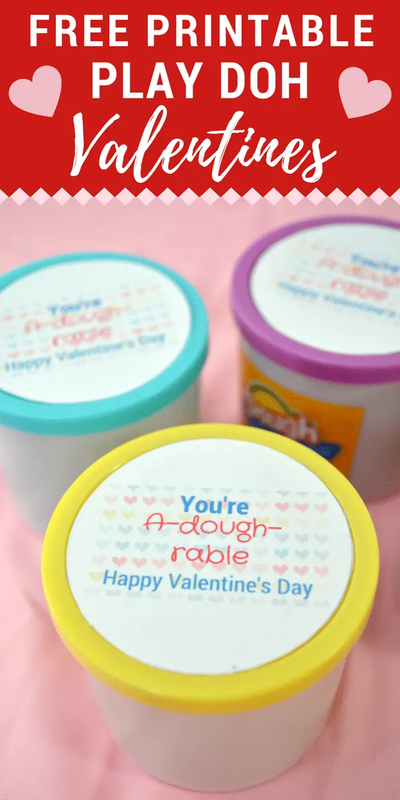 This super cute “You’re A-dough-rable” Play Doh Valentine Printable is the perfect example of a cheesy Valentines Day style play on words. Even as adults we can’t help but smile as we roll our eyes, right? Of course, children love all the cute little sayings and word play as well. 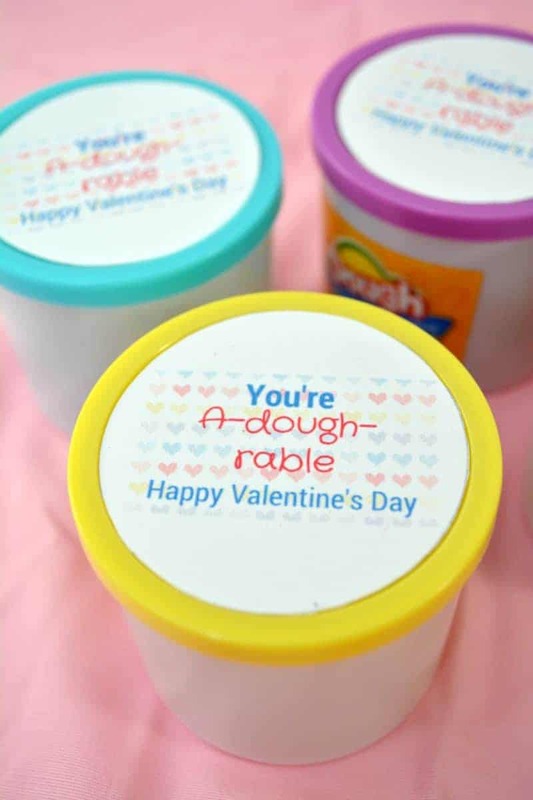 This “You’re A-dough-rable” Play Doh Valentine never fails to get the kids to giggle. Instead of passing out candy that some kids may not be able to have, your child can pass out these little Playdough Valentine's Day gifts to their class. Not only are these Play Doh Valentines funny, but they are useful too. I mean, who doesn't love themselves some Play Doh?! Best of all, these Valentines gifts are so easy to make! If you want to help your child create a Valentine's Day gift for their classmates that will leave their them smiling, this Play Doh Valentine gift is perfect! 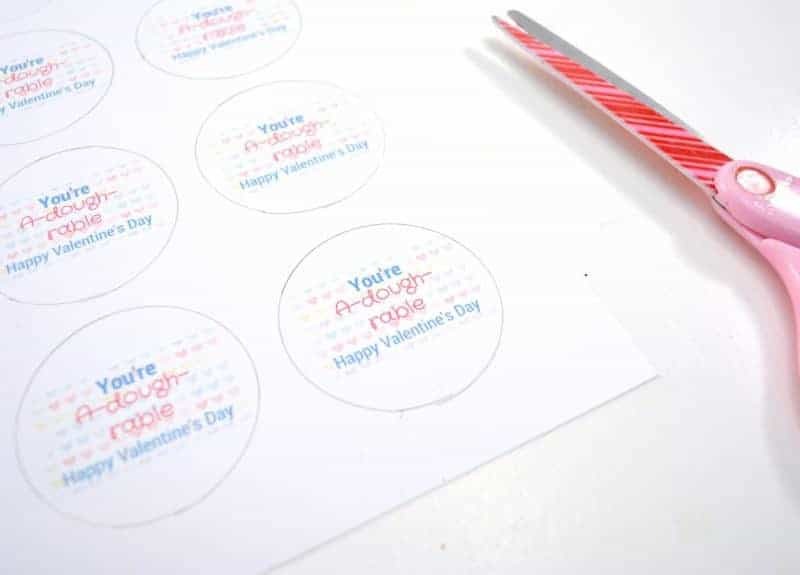 Everything you need for this Valentines gift craft, aside from the printable found below, can likely be found at your local dollar store. You can usually even find brand name Play-Doh there, or several packs of off-brand playdough for only a dollar. Or if you prefer shopping online, you can order sets of Play Doh on Amazon in 10 packs, 24 packs, or 36 packs. 1. Download “You're A-dough-rable” labels here, and print out. For your convenience the download has 12 labels per page. 2. 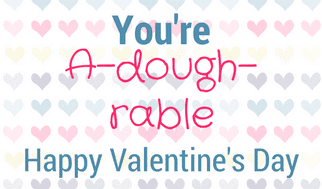 Cut a 2″ circle around each label on the “You’re A-dough-rable” Valentine’s printable. You can use the lid of the small Play Doh containers to trace the circle and then just cut each one a bit smaller. The goal is to get each label to fit inside the lid of your Play Doh containers. 3. Use double sided tape to attach a label on the center of each lid. Or, simply attach the labels if you used sticker paper. 4. Tie a ribbon around each container to add some additional flair (optional). I hope you enjoy this fun printable and that you are your little ones have a very happy Valentine's Day. This is a creative Valentine! I think my college daughter would love this idea too! oooohhh this is amazing, my kids love playdoh, they will love this. I love this! This would be so great for my daughter’s preschool class. I love how easy it is. And I really like that it’s a non-candy option! OMG this looks like so much fun to do! This is a super cute idea! Thank you! These are absolutely adorable, definitely keeping these in mind this Valentines Day. Oh my goodness, this is so outrageously cute! I love this printable and everything about it. It’ll really stand out and set my little one apart. You could even *make* the dough as a fun craft with kids. What a cute and clever idea. This would be fun to give and to receive. These are nice, and so easy, and not messy! And you can tell the kids would have fun doing this! This is adorable. I always loved when the kids got non candy valentine gifts. They really didnt need all that candy!